All chapter leaders are invited to participate in our quarterly board meetings and report on local activities. These regional Board meetings help chapter leaders meet and learn from one another, while enjoying the camaraderie of fellow members. 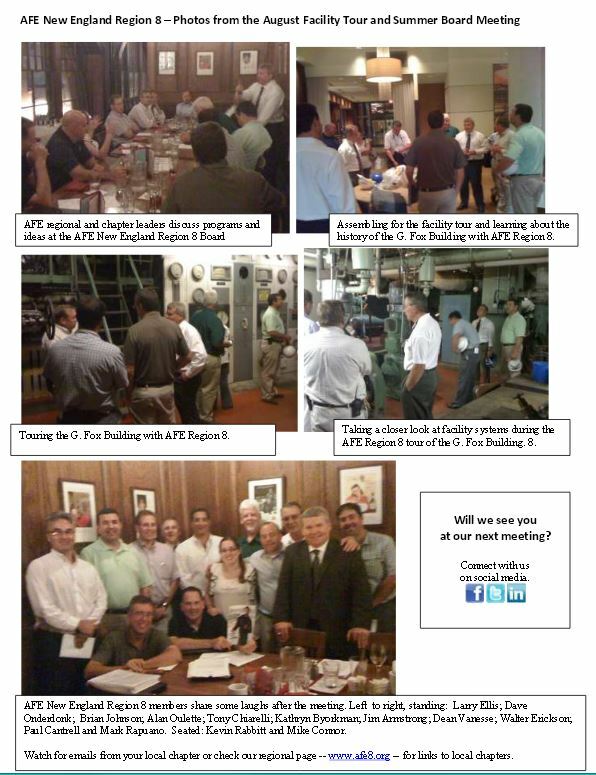 At each meeting, we will review upcoming and recent activities and show how AFE is working to provide our New England facility engineers with the peer to peer networking, business tools and career and educational opportunities crucial to your success. All chapters are encouraged to send a representative. Chapter leaders: Please send a representative. Dinner is included. Please email your RSVP to Alan Ouellet, Region 8 Vice President at aouellet@filtersales.com. AFE New England Region 8 May Dinner Meeting, following our tour of Mohegan Sun in Connecticut. AFE New England Region 8 continues its strong focus on programs that bring members together and enhance their professionalism. The AFE Region 8 Board held a regional board meeting in New Hampshire that was attended by members from Connecticut, Maine, Massachusetts, New Hampshire and Rhode Island. At the dinner meeting, also a regular Region 8 Board meeting, reports were given on national and regional AFE business by Regional VP Paul Cantrell and Secretary Alan Ouellet. Paul Cantrell thanked outgoing Treasurer Tony Chiarelli and welcomed new Treasurer Jim Armstrong. The group then discussed a number of issues including local chapter activities, plans to relaunch the Maine chapter, and tours and certification programs. Maine representatives outlined their plans to host tours and events and revitalize the dormant Maine chapter, The regional board voiced their support and offered their assistance. Wayne Saya was on hand to demonstrate elements of the new national website. Steve Nicholas, who had come directly from the November CPMM program, updated the group on the latest CPMM designees and his class. Anne Doherty Johnson of ADJ Association Management & Marketing reviewed the progress of our initiative to relieve the administrative burden for chapter leaders. We are now working with Chapter 33 (Boston), Chapter 140 (Granite State/New Hampshire) and are starting work with Chapter 74 (Worcester) and helping with the re-launch of the Maine chapter. Chapter leaders added to a good discussion about how AFE facility tours, certification programs, networking and professional development programs are helping our members. Several chapters recently completed golf tournaments (Boston and Rhode Island chapters) and a Vendor Night and Member Appreciation Dinner for New Hampshire members in December was reviewed. Local chapters are now planning facility tours and educational events for the remainder of the year and 2014. To view additional photos, visit our our Facebook page.